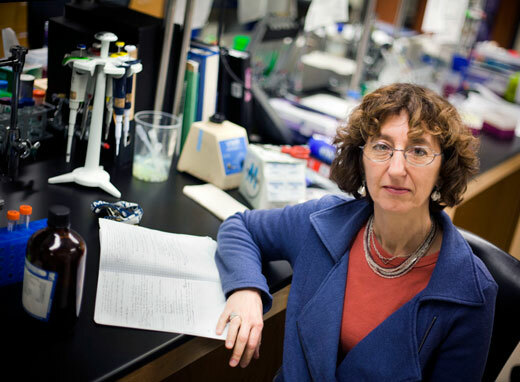 Physicist Laura Finzi runs one of a handful of labs using single-molecule techniques to study gene transcription. Have you ever had to remove a tiny speck of glass from your foot with a pair of tweezers? Imagine if that speck of glass was microscopic. Emory physicist Laura Finzi uses magnetic tweezers and minuscule metal beads to tug on individual DNA molecules. Her lab studies the mechanics of DNA transcription, the first step in the expression of a gene, a process that is partly regulated by the bending and uncoiling of DNA. Protein-mediated loops in DNA operate like genetic switches. Often, when a loop is closed, transcription is “off” and when the loop is open, transcription turns “on.” In other cases, the loops connect proteins to turn on transcription. Identifying the physical and mechanical parameters of this process could lead to a better understanding of the causes, and potential treatments, for many diseases. A native of Italy, Finzi is married to Emory biophysicist David Dunlap who has his research group in the cell biology department. In the interview below, Finzi tells eScienceCommons about her Italian roots, and why she became a physicist. What makes your lab unique? We are one of only a handful of physics labs using single-molecule techniques to study DNA transcription, and we combine three of these methods in our studies: Tethered particle motion, magnetic tweezers and atomic-force microscopy. In TPM, when you see the tethered plastic microspheres wiggle and shake, it’s like seeing the molecular world in action. With a tethered magnetic bead, a pair of magnets over the microscope stage becomes a pair of tweezers that we can use to twist and stretch the DNA precisely. In AFM, we see the macromolecules like bumps on an atomically flat surface. Another thing that makes my lab unique is the gender balance: Five women and three men. What was it like growing up in Italy? My mother was a pianist and my father was a harbor engineer. We lived in Ravenna and Trieste on the Adriatic Sea, and later in Bologna. I have two elder sisters. My father always said that we needed to get married. But he also said that we had to be well-educated and have jobs that made us independent. He combined a traditional and a modern view. What inspired you to become a physicist? My father really wished that we all would have become engineers, and both of my sisters did. But as the youngest, I thought that they would have always told me, “Listen to us, we have more experience,” so I was eager to strike out in another direction. Before graduating from college, I met a brilliant biophysicist, Carlos Bustamante, now a member of the American National Academy of Science. He offered me a position in his lab as a graduate student. He had a charming personality and was full of enthusiasm. He was always throwing fascinating challenges at his students. He’s the reason I became a biophysicist. How did you and David Dunlap meet? We were both graduate students at the University of New Mexico. David was very different from anyone I’d seen before and impossible not to notice. He’s very tall and often had mismatched, brightly colored socks. Given an Italian sense of fashion, I could not help but notice his bizarre taste. He thinks out of the box, and is a very creative and happy person. I enjoy downhill skiing, it’s like a ballet, very elegant and gentle and harmonic. And I love the white of the snow and the scenery above the tree line. It’s enchanting. I like sports in general and being in shape. It feels good. We live near campus and I either walk or ride my bike to work. David and I have two wonderful and smart teenagers. The four of us, and Spark the dog, go for hikes and canoeing. Yes, we like to cook at home, and we prefer a Mediterranean diet. My chocolate salami, an Italian dessert, is well-appreciated by my colleagues at Emory.